This 1994 Tony Award nominee for Best Musical is the first R&H revue ever to hit Broadway. In the words of USA Today, "It's enough to restore one's faith in the future of the revue and the durability of Rodgers & Hammerstein." This fresh take on the R&H canon features over two dozen songs encompassing standards as well as rarely-heard gems. When Rodgers & Hammerstein's first original musical was rediscovered in a special concert as part of New York City Center's Encores! series in 1994 (see Happy Talk, Vol. I, No. 3), audiences and critics alike were dazzled by the innovations of what Stephen Sondheim, Hammerstein's assistant on ALLEGRO, called "the first really good experimental show." Told with beautiful imagery and a ravishing score, this Everyman story remains timeless in its appeal. Its theme - striving towards personal fulfillment whatever the obstacles - is quintessential Hammerstein. Hammerstein's bold reinterpretation of Bizet's classic opera CARMEN sets the story in a rural Southern town during World War II, and calls for an all-black cast. The libretto is infused with American humor, muscle and grit and the score is a synergistic melding of classical opera and crackling vernacular. Confirming the work's longevity, a contemporary British production ran in the West End for three years, received the Olivier Award as Best Musical (1992), and is currently on a U.K. national tour. Though it premiered fifty years ago, CAROUSEL today enjoys a popularity that most new musicals would envy: acclaimed in London and on Broadway with award winning productions in '93 and '94, CAROUSEL is now playing in Japan and will have a U.S. national tour by early '96. As profound today as when it was written in the waning days of World War II, CAROUSEL continues to resonate with its universal fable of love and redemption. It's possible! A musical that combines all the elements of the classic fairy tale - including a glass slipper, a Fairy Godmother and a pumpkin coach - with a sparkling Rodgers & Hammerstein score. A hit this past season on the summer circuit, and a Christmas perennial, CINDERELLA is also in pre-production for a return to its roots on television - this time starring Whitney Houston (and scheduled for broadcast in late '96). But despite her magical appeal on the TV screen, there is something about seeing this beloved tale told live that guarantees CINDERELLA her own little corner on stages everywhere. When Rodgers & Hammerstein's first musical celebrated its 50th Anniversary in 1993, more than 900 productions were presented across the country, and kudos included a commemorative U.S. postage stamp and a special Tony Award. The landmark American musical that signalled a triumphant turning point in Oscar Hammerstein's career, OKLAHOMA! is as fresh as a beautiful mornin', and still doin' fine. A story of love in a world at war, this Pulitzer Prize winner based on James A. Michener's classic novel features some of the most romantic songs ever written for the musical theatre set against one of the most dramatic events of the 20th Century. Fifty years since the end of World War II, SOUTH PACIFIC carries a message that still deserves to be ""carefully taught"" - a plea for tolerance, a need for compassion. This epic musical journey captures the high drama and low comedy of life on a Mississippi show boat at the twilight of the last century. With music by the incomparable Jerome Kern, this lyrical masterpiece features a score unparalleled in the musical theatre, and is considered to be the highpoint of Hammerstein's success-studded career. Nearly seventy years old, this masterwork is no museum piece - in fact, it is the biggest hit of the 1994-95 Broadway season, winner of 5 Tony Awards, 5 Drama Desk Awards and 4 Outer Critics' Circle Awards, confirming its status, decreed by Vincent Canby in the New York Times, as "the daddy of them all." 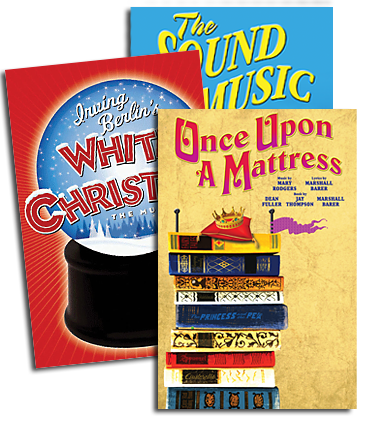 Contact The Rodgers & Hammerstein Theatre Library at 229 West 28th Street, 11th floor, New York, New York 10001. Phone: (212) 564-4000; Fax: (212) 268-1245."